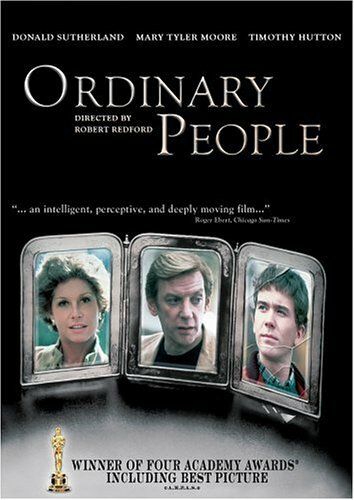 Yesterday I had the pleasure of watching the 1980 American film Ordinary People. The film begins with shots of an idyllic, rich suburb, with beautiful trees lining the broad avenues, people living in large, comfortable houses, and going to the theatre in the evenings to enjoy themselves, driving in their expensive cars. The comfort and the natural beauty of their surroundings is in synch with the smiles on their faces, but taking a deeper look, their inner lives tell a different story. The subject of this particular story are an upper middle-class American family – a father, mother and their son in his late teens – struggling to cope with the recent death of their elder son in a boating accident. Conrad, the surviving son, fights with the guilt of not having been able to save his brother when the two were boating together. Unable to deal with the conflict, he has himself, recently, unsuccessfully tried to kill himself. Beth, the mother, lives the ‘perfect life’ where everyone sees her as a happy, good-looking, confident woman who manages her home well. Underneath the mask, she is a woman living in denial. Beth is unable to express affection for her younger son, does not like to discuss the elder son’s death and its aftermath, and spends her time playing golf and socializing. Calvin, the father, sincerely tries to bridge the gap between his wife and son. He worries about his younger son and feels responsible for not taking good enough care of Conrad and his attempted suicide. Further, he longs for a wife who would share with him the grief of having lost a son, who would weep with him, and express their sorrow rather than deny it exists. Calvin wonders what changed since the time he and Beth married each other, when the two used to connect so well. First-time director Robert Redford tells a story that clearly does not belong to the genre of cinema that seeks to entertain. Instead, he paints a picture of reality. The protagonists of the film are not a rare species of people, totally different from us. Rather, they are just like us. They all have their internal struggles, their impossible hopes and unfulfilled longings. When they go to sleep, they wonder, staring at the moonlight, if there will be a day when their lives will be as they wish. They are ordinary people. In the first half of the film, the family moves along quite comfortably, easily avoiding the difficult areas. Mother and son try not to spend time alone with each other. The son does not discuss his problems with anyone but withdraws. The father and mother lose themselves in dinner parties where they can leave behind their difficulties in social niceties over a glass of wine. However, Conrad, the son, finds it difficult to cope. He starts to see Dr. Berger, a psychotherapist. Over the months, Conrad realizes his anger at his mother for not being able to comfort him in these tough times, and also his anger at his deceased brother. At the same time, Jeanine, an angel-like girl makes friends with him, giving him the love that makes him trust the possibility of being able to express his own feelings without fear. By the end, one feels happy to have watched this simple, gentle film. It tugs at the strings of our emotions and makes them feel alive, bringing to life all the struggles involved in living a life that is responsible and loving. It tells us that bad things happen, not just to those people out there, but to simple, honest people like ourselves. Life can be difficult. Happiness is not forever. Neither is sadness. At its heart, the film is a glimpse, not into the lives of extraordinary people, but into the remarkable lives of ordinary people like ourselves. “A little advice about feelings kiddo: don’t expect it always to tickle.” – Dr. Berger, the psychotherapist. ~ by tdcatss on May 23, 2011. Thanks Kaif! Great review . . .you are good at this. :) I haven’t watched the movie, but can relate to all of the deeper issues going on beneath the surface. Relationships can be so complicated. Take care and keep writing!!! Shghuttei, you can borrow it from me when you return Mirror! Yes, one does connect to this film. It is like an Ingmar Bergman film, without the raw neurotic energy of those films, but with a dignified aura that some American films seem to have. Thanks Debbie. I really like such psychological films which go beneath the surface. They really make cinema qualify as an art form. Wonderful review; your writing reminds me of Roger Ebert’s writings… Touches the heart with insight and clarity.